Yes, this is a blog about preparing name tags. Name tags or badges are those simple and remarkably effective little tools that introduce us to each other at conferences or other events. 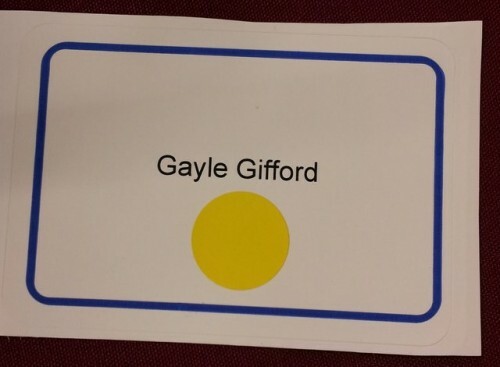 Name tags help us overcome our shyness about talking to someone we don’t know by removing the need to ask their name. Or, even if we’ve met before, avoid the embarrassment if I’ve forgotten your name. They help people new to a group navigate faster. I depend on name tags. I want and need to know the names of the people around the table or around the room at the retreat or meeting I’m facilitating. Or across the dinner or lunch table at the conference or special event I’m attending. If your team isn’t too large and our work together long enough, I’ll learn your names a short time into the meeting. Having the printed name with the face helps me learn. Even in the college classes I’ve taught, I’ve needed name tags for at least three classes for the ones with 20 students before I finally remember who you are. Unfortunately, most of the time I’m silently cursing the person who picked the type size for the name tags. You see, my eye sight isn’t what it used to be – near or far. But that’s not unusual. It would be very rare to be in a group where everyone has spectacular vision. I need REALLY BIG TYPE to be able to read your name from a distance. The guidelines for displays are 36 point text or larger to be seen from 5 feet away — that’s half an inch, which in my experience is still pretty tiny for catching the name at a glance. I’d prefer 3/4 to an inch if I’m working close by. Across the room, display type should be 150 points or larger – which is at least 2 inches. I only really need your first name to be really large, because that’s the name I’ll be using. Last names and, if needed, the name of your organization can be smaller. When I ask people to write out their own tags, I give them thicker markers (not tiny unreadable ball point pens) and ask them to ink in their first name as large as will fit on the tag. Right shoulder. And if you are wearing your name on a lanyard, it completely undoes the usefulness of the tag if your name is down around your waist. If the lanyard doesn’t adjust, try knotting it in the back to eye level height. So… help people connect better by training yourself or your administrative team to put READABLE SIZE NAMES on your name tags. And I’ll add a kind word for using those highly readable table tents name tags — especially for board meetings. You can keep them for every meeting and use them to pre-assign seating.Mixing people up can change the dynamics of conversations and help members get to know one another better by moving them to sit beside directors they don’t know as well. I’d love to hear your name tag tips.